What Does it Mean When My Dog Puts His Paw on Me? Home / Behaviors / What Does it Mean When My Dog Puts His Paw on Me? Our dogs do a lot of things to communicate with us, but we often have a hard time understanding what they are trying to say. Along with barking at you, pawing at you is among the most common ways your dog might try to communicate with you. Naturally you ask, what does it mean when a dog puts his paw on me? Well, as with most communication attempts your dog makes, your dog putting a paw on you may mean a range of different things. To find out what your dog is trying to say, first identify the specific situation and the exact behavior that your dog is displaying. A dog may place his paw or head on you, hold your hand or arm with his paws, or paw actively at you. Each of these behaviors is most likely to be tied to a different communication. There are lots of reasons why your dog may be using his paws to communicate with you, but most of the reasons fall under attention or affection. 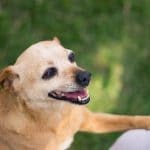 Dogs that have learned to give their paw as a command may be especially likely to try this technique to get your attention, but any dog might try laying a paw on you to communicate with you. 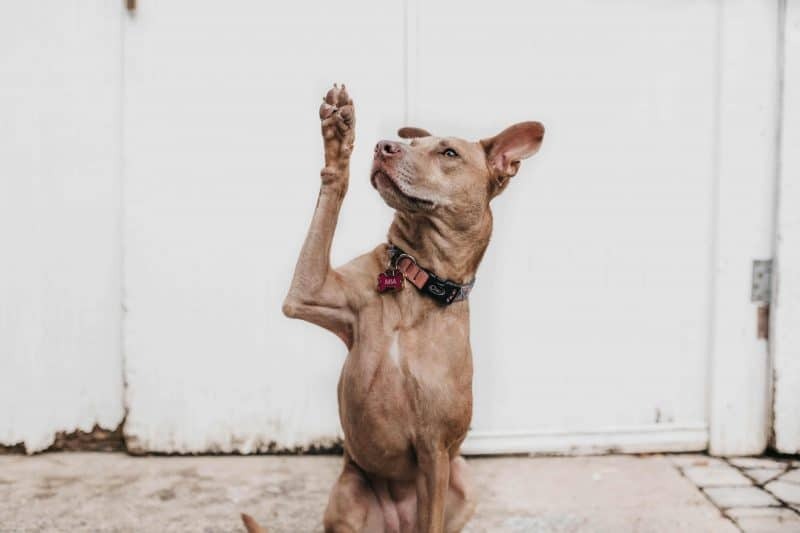 After all, humans and dogs have evolved together for a very long time, and since humans are so hand-centric, it is no surprise that dogs have learned to use their paws to communicate with us. If your dog is putting a paw on your knee or shoulder and staring at you intently, chances are he is looking for either affection or attention, or both. If your dog also lays his chin on your knee, it is even more likely that this is what he is saying. If you see a toy lying near your feet or if your dog actually drops a toy on you in addition to laying a paw on you, his intentions become even clearer. This is a very natural way for your dog to get your attention when he wants to play without being rude by barking or pawing. If your dog leans happily into your hand when you pet her, you will know that most likely he was looking for affection. Some dogs hold your arm or hand while you are petting them, with one or both paws. This can be a return of affection, or your dog may be directing your hand to just where he wants to be scratched. 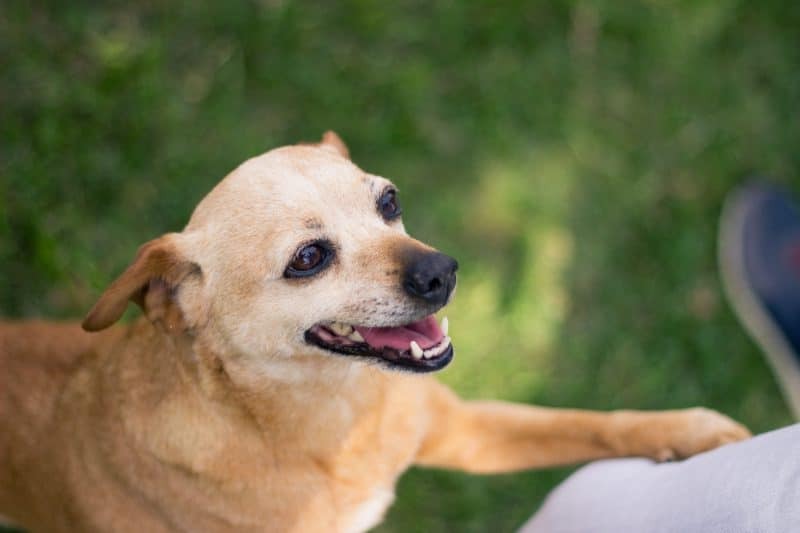 Your dog may hold your hand to his head in an attempt to make the petting go on forever, and many dogs will grab your hand with their paw or even their teeth when you stop petting them and try to drag the hand back to petting. Dogs are creative communicators who often have hilarious ways of expressing themselves and getting what they want. 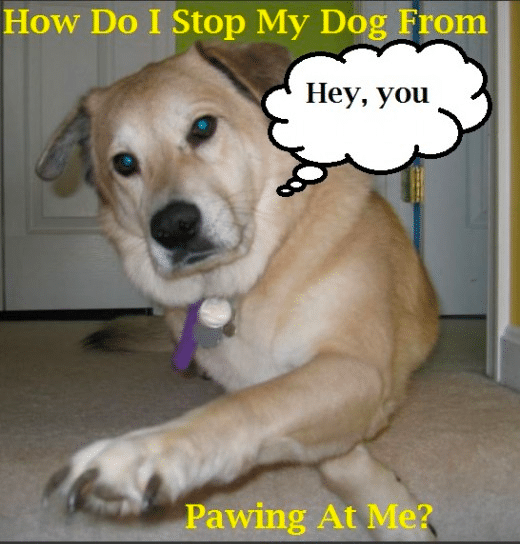 Your dog may use his paw to ask you to start petting, keep petting, or never stop petting. Pawing at you is a more vigorous way of communicating than just laying a paw on you, and is more likely to indicate that your dog wants more from you than just affection. If your dog bounces away from you in a play bow or gets a toy when you pay attention, it is likely that your dog wants to play. Dogs often initiate play by pawing towards the play recipient. They do this with people, with other dogs, and even cats, birds, or other animals. If your dog is uncertain about something during a game or exploration, he may paw at you to show him uncertainty. Try doing the activity first to encourage his confidence. If dinner time is near or you are eating, your dog could paw at you to draw your attention to the fact that he is hungry and would like some of what you have. A pawing followed by a hopeful puppy stare is a clear sign that your dog is begging. Pawing at you could also mean that your dog is trying to tell you that he is anxious or that something isn’t right. If your dog paws at you and is uninterested in food or play, and especially if he is panting or drooling or is carrying his tail low, you can feel relatively confident that your dog is expressing anxiety. Dogs with thunderstorm anxiety often begin pawing at their owners and expressing anxiety well before the storm arrives. If your dog experiences separation anxiety, he may paw at you when the time is coming that you usually leave, or if you perform any of the cues that your dog associates with you leaving. If your dog can’t seem to get comfortable, even when you give him affection, he may be experiencing pain. If this behavior is recurrent or goes on for long, you should have your dog checked by your vet to rule out medical causes. Understanding some of your dog’s other body signals can help you identify why he is pawing at you. By watching the way your dog looks at you, carries his ears and tail, and other behaviors, you can figure out why he is pawing at you or putting his paw on you. Dogs that paw at you or hold a paw on you with an attentive gaze, pricked ears, and wagging or upheld tail are looking or engagement or play. 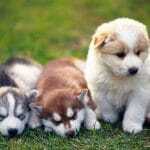 Such dogs are also likely to bark, spin in circles, or play bow to make their intentions even clearer. A dog in this state of mind is unlikely to stand still for petting, and it may be difficult to deter her. A dog that is trying to get your attention because he is anxious about something will prick his ears as he focuses on you, but he is likely to also glance around and pace, as well as pawing at you. An anxious dog is more likely to paw at you than just lay a paw on you, but some dogs trying to show self control may contain themselves and just lay a paw on you between pacing. A dog showing these signs may be anxious or in pain. The signs can be difficult to tell apart. Have your vet check to make sure your dog isn’t in pain. Medications prescribed by your vet may help with serious anxiety or chronic pain, or an over the counter or homeopathic remedy may be a good solution for your dog. A dog that lays his paw on you or gently paws at you with a relaxed look about his is most likely asking for affection. Such a dog will immediately lean into a pet and is likely to immediately ask for more if you stop petting her. These dogs often nudge your hand with a paw or nose if they can as well. It is worth taking the time to give your dog attention when he asks for it in this way, so long as he is not too persistent or asks too often. Giving your dog affection when he needs it helps he learn to trust you and solidifies your bond. If you are busy, you can teach your dog that he can’t always have your attention or affection, and that he must wait for it. Remember to give your dog the attention he craves, however, or he may just turn that energy on your house. High energy dogs may require a lot of attention and mental and physical exercise, and if you aren’t providing it, you can bet that your dog will find ways to get your attention. The fact is, you can’t always give your dog the attention he wants when he wants it, and nobody wants to feel pestered by their dog. Start by teaching your dog a new way to get attention. Ask your dog to sit when you notice him about to paw at you, then give his affection or toss a toy for her. If he paws at you, ignore his until he sits. Once your dog is sitting for attention instead of pawing, you can move onto the next training stage: wait for attention. When your dog sits for attention, tell him “not now” and ignore his until he walks away, then give him attention. This is a great time to use a good chew toy or food dispensing toy to occupy your dog without occupying your time. Continue extending the time that your dog has to wait for your attention until he is going several hours without bothering you. Be certain to give your dog a good long play session, walk, or a trip to the dog park after being patient for several hours. In time your dog will learn that he can express his need for engagement just by sitting in front of you, and that he can get what he wants if he waits patiently for it. 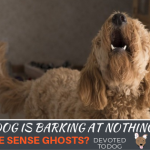 Your Dog is Barking at Nothing – Can She Sense Ghosts?